A sweet smaller-sized but BIG flavored birthday treat! Our vanilla fortune cookie is baked to order and hand dipped in your choice of caramel, dark, milk or white chocolate. Send them Happy Birthday wishes and some good fortune too with our Birthday Baby Gourmet Fortune Cookie. It's the perfect birthday gift and greeting all in one! 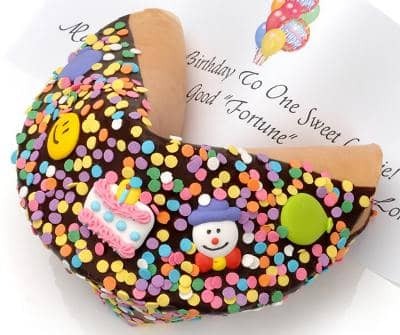 This Baby Giant Fortune Cookie is first hand dipped in your choice of the finest gourmet Belgian Chocolates---(Dark, Milk, or White). It is decorated with 100% Hand Made Royal Icing Birthday Decorations...Then, our confectionery artisans finish it with a generous sprinkling of multicolored Candy Confetti! Your personalized message goes on the 8.5"-long Fortune inside making this a perfect way to send Good Fortune for any occasion! Hand wrapped in a clear cello bag and tied with a lovely ribbon. Our Baby Giant Fortune Cookies are about the size of a baseball.